A BROKEN TRINITY tie-in! In First Born, The Angelus power chose the troubled young woman Celestine as its host. Now, Celestines split personality struggles with The Angelus force for ultimate control, even as a rogue contingent of Angelus warriors plot their leaders overthrow. 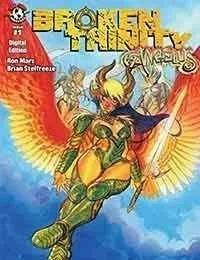 This is the second of three tie-in stand-alone issues to Broken Trinity, featuring the heavenly art of Brian Stelfreeze (Batman: Shadow of the Bat, X-Men: Unlimited) and the second of three alternate covers by Jeffrey Spokes (Sadhu: The Silent Ones). Other tie-in issues feature Witchblade and The Darkness.